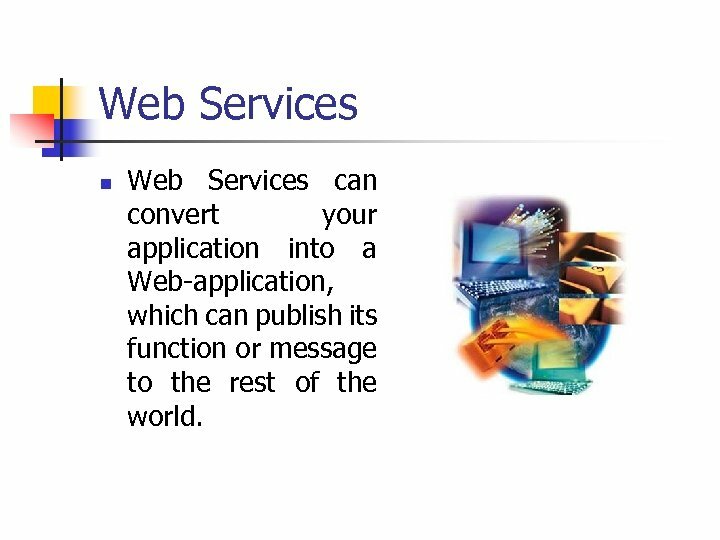 Web Services n Web Services can convert your application into a Web-application, which can publish its function or message to the rest of the world. 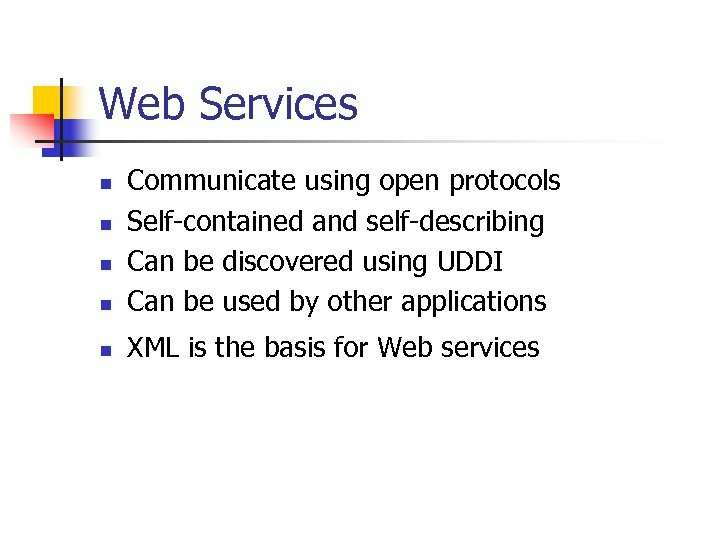 Web Services n n n The basic Web services platform is XML + HTTP. 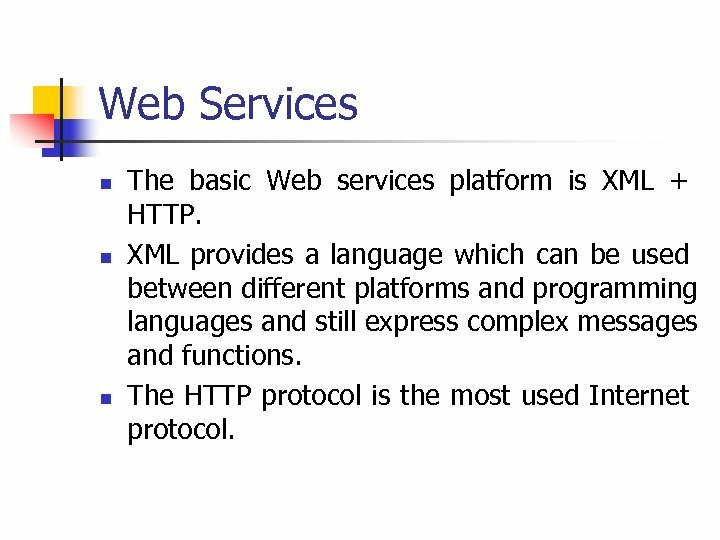 XML provides a language which can be used between different platforms and programming languages and still express complex messages and functions. The HTTP protocol is the most used Internet protocol. 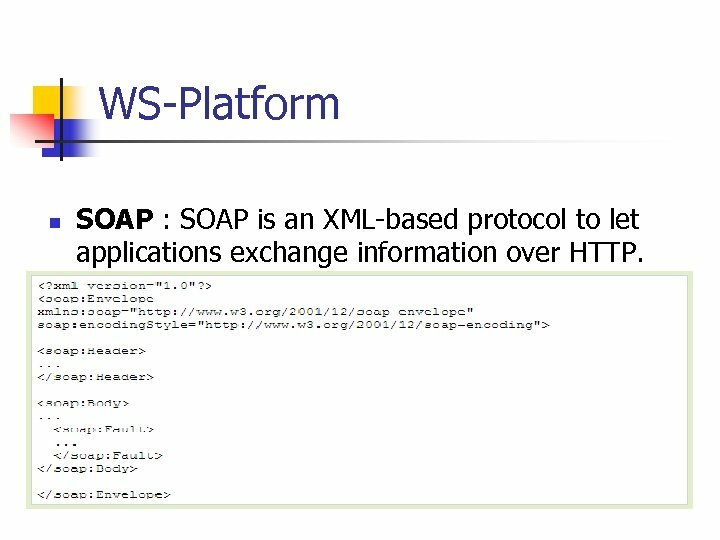 WS-Platform n n SOAP : SOAP is an XML-based protocol to let applications exchange information over HTTP. It is platform and language independent. 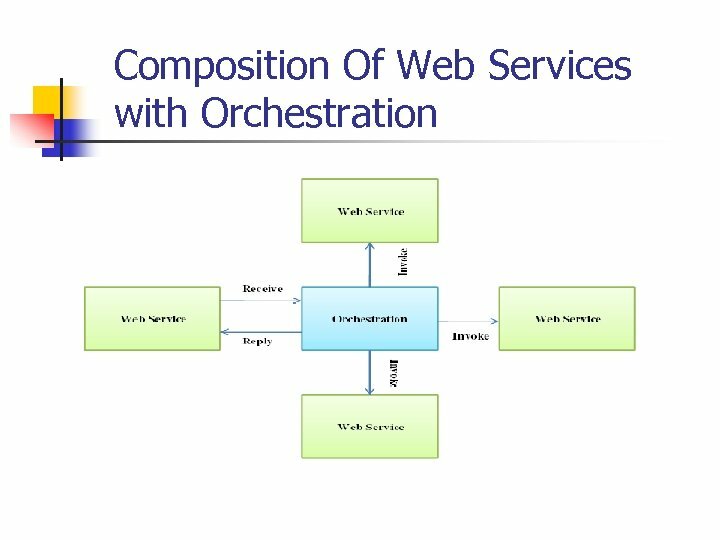 Orchestration n n It describes how web services can interact with each other at the message level, including the business logic and execution order. 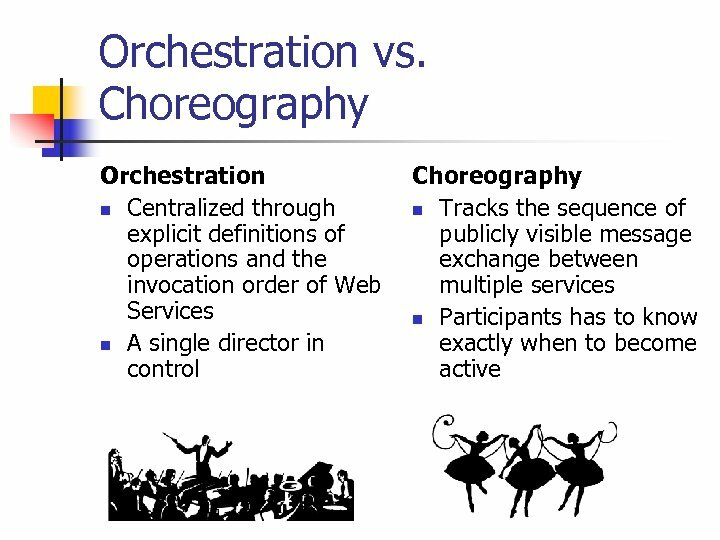 With orchestration, the process is always controlled from the perspective of one of the bussiness parties. 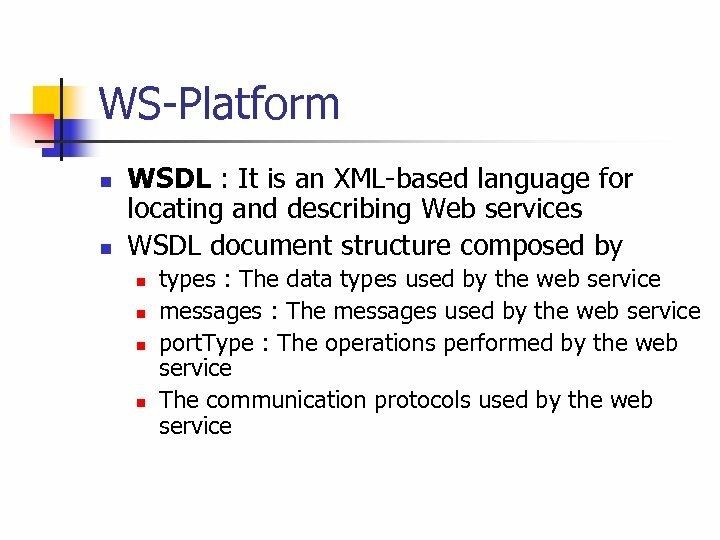 Early Work n Many languages have emerged in the literature for web service orchestration including WSCL, XLANG AND WSFL. 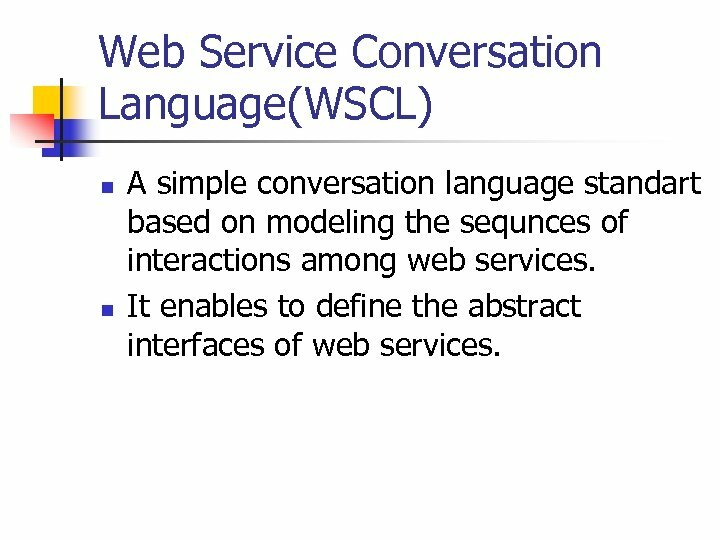 Web Service Conversation Language(WSCL) n n A simple conversation language standart based on modeling the sequnces of interactions among web services. 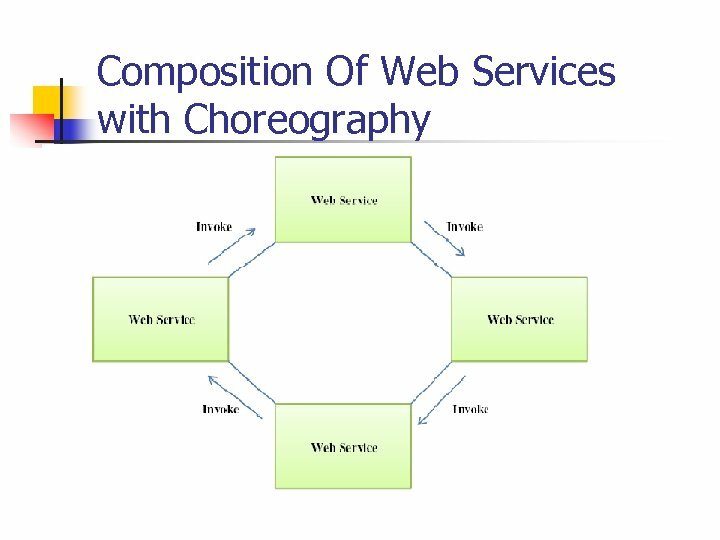 It enables to define the abstract interfaces of web services. XLANG n n It was developed by Microsoft. 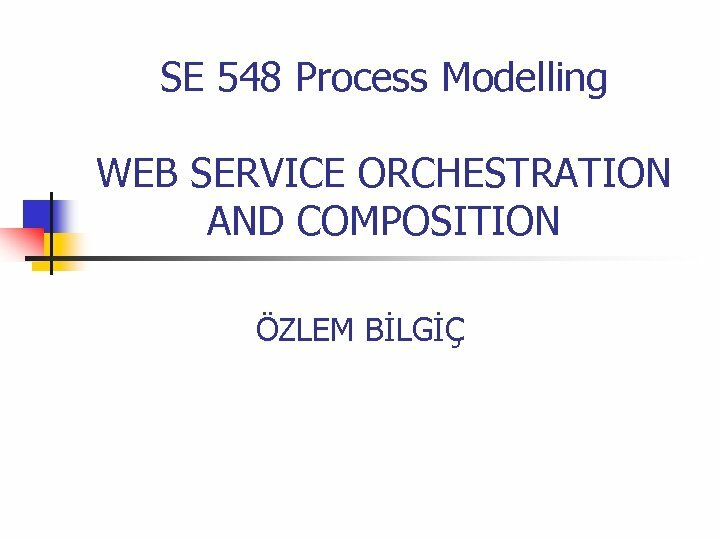 Focused on the creation of business processes and the interactions between web service providers. The specification provided support for sequential, parallel, and conditional process control flow. 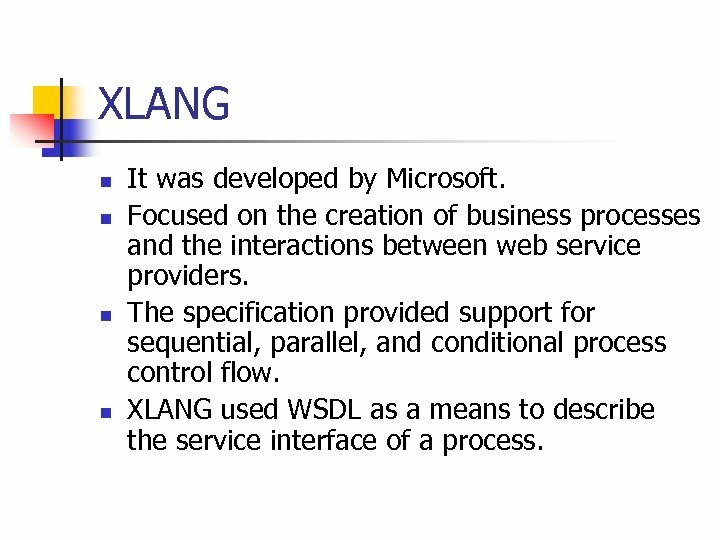 XLANG used WSDL as a means to describe the service interface of a process. 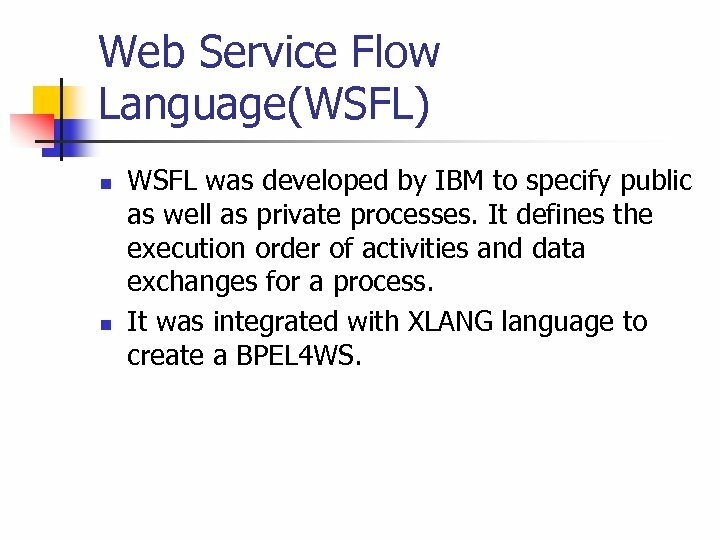 Web Service Flow Language(WSFL) n n WSFL was developed by IBM to specify public as well as private processes. It defines the execution order of activities and data exchanges for a process. It was integrated with XLANG language to create a BPEL 4 WS. 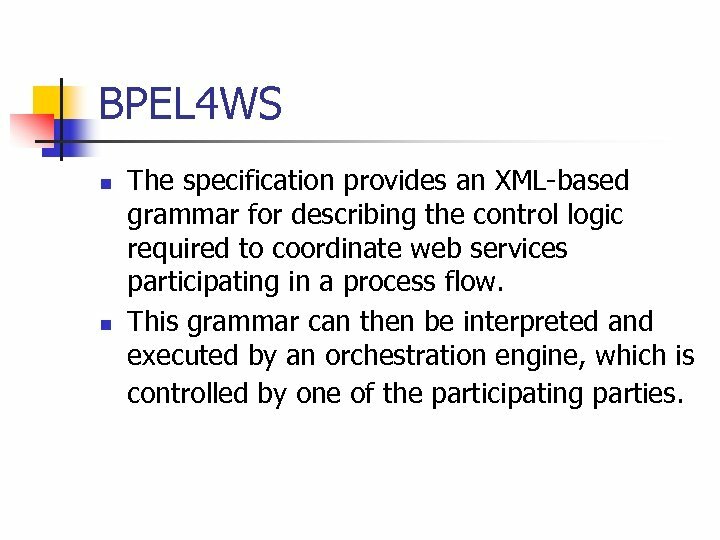 BPEL 4 WS n n The specification provides an XML-based grammar for describing the control logic required to coordinate web services participating in a process flow. This grammar can then be interpreted and executed by an orchestration engine, which is controlled by one of the participating parties. 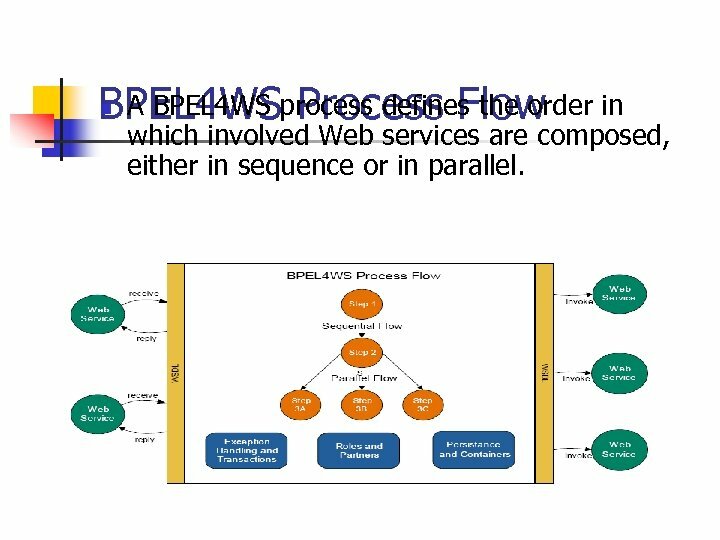 A BPEL 4 WS Process Flow BPEL 4 WSprocess defines the order in n which involved Web services are composed, either in sequence or in parallel. 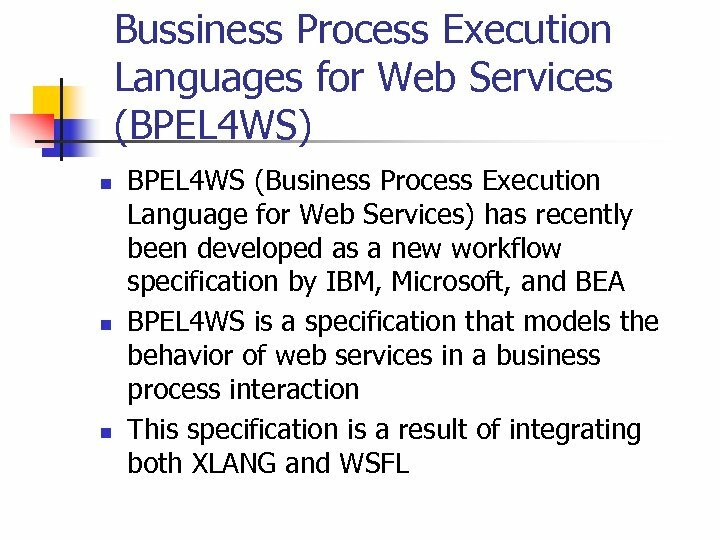 BPEL 4 WS n n n BPEL 4 WS provides support for both executable and abstract business processes. An executable process models the behavior of participants in a specific business interaction, essentially modeling a private workflow. 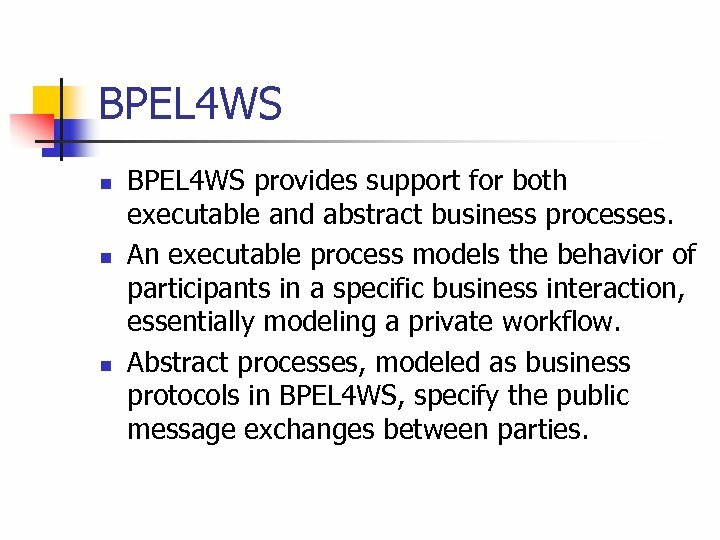 Abstract processes, modeled as business protocols in BPEL 4 WS, specify the public message exchanges between parties. 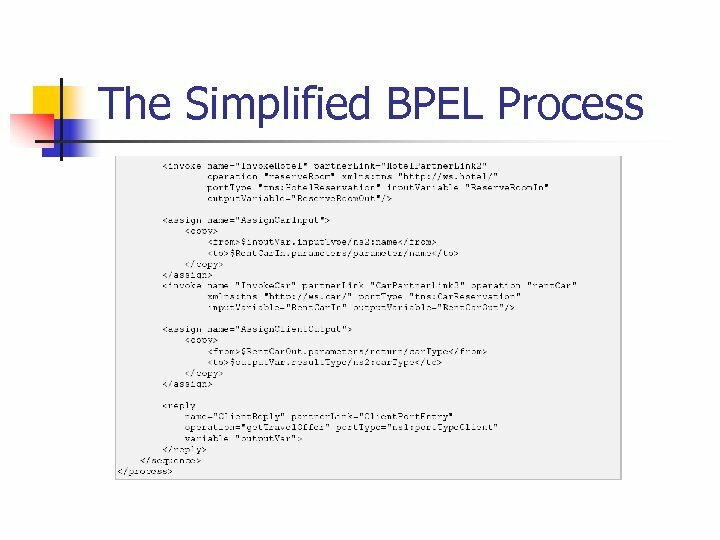 How to bulid a BPEL process? n A process consists of a set of activities. 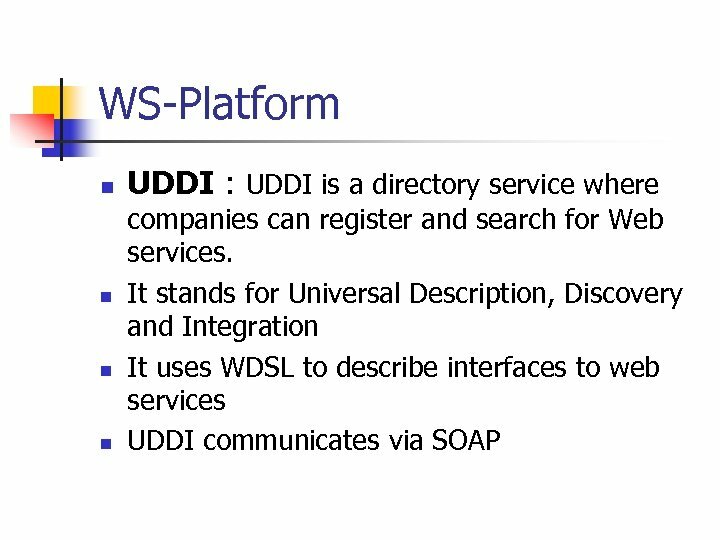 It interacts with external partner services through a WSDL interface. 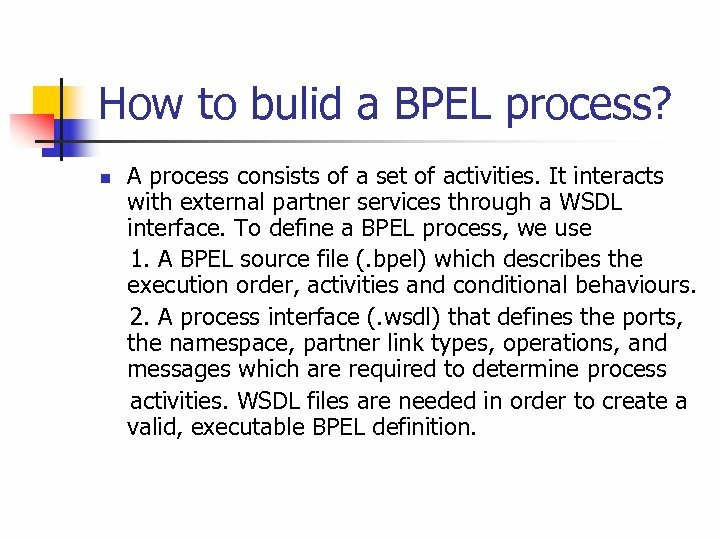 To define a BPEL process, we use 1. A BPEL source file (. bpel) which describes the execution order, activities and conditional behaviours. 2. A process interface (. 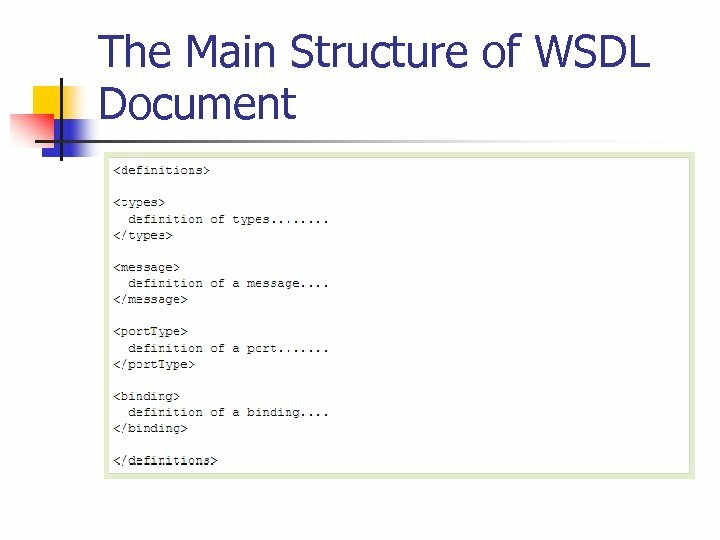 wsdl) that defines the ports, the namespace, partner link types, operations, and messages which are required to determine process activities. 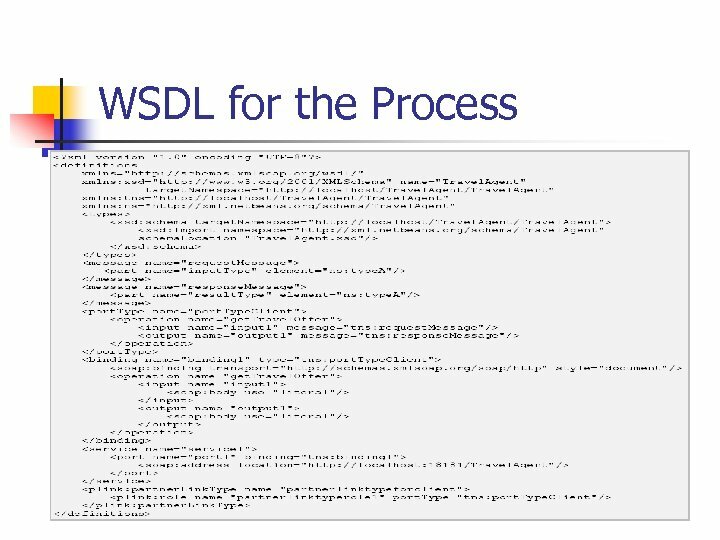 WSDL files are needed in order to create a valid, executable BPEL definition. 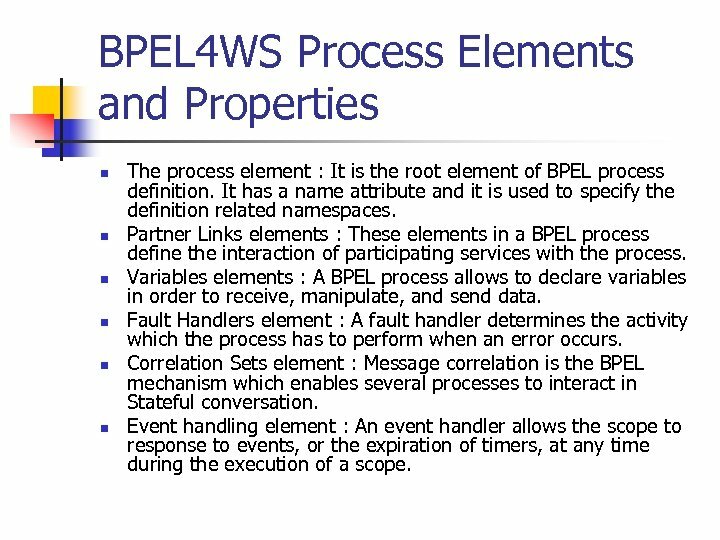 BPEL 4 WS Process Elements and Properties n n n The process element : It is the root element of BPEL process definition. It has a name attribute and it is used to specify the definition related namespaces. 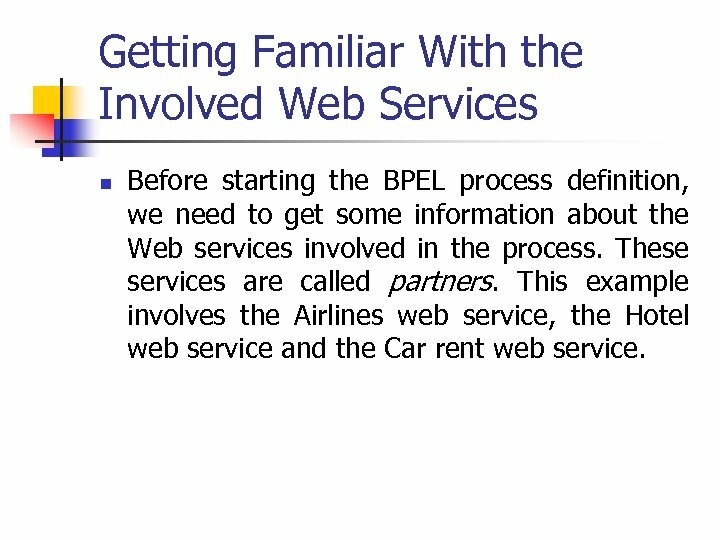 Partner Links elements : These elements in a BPEL process define the interaction of participating services with the process. 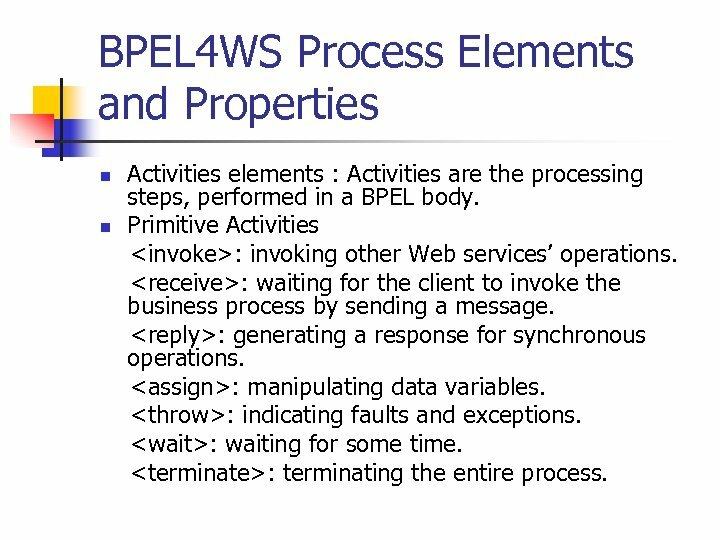 Variables elements : A BPEL process allows to declare variables in order to receive, manipulate, and send data. Fault Handlers element : A fault handler determines the activity which the process has to perform when an error occurs. Correlation Sets element : Message correlation is the BPEL mechanism which enables several processes to interact in Stateful conversation. Event handling element : An event handler allows the scope to response to events, or the expiration of timers, at any time during the execution of a scope. 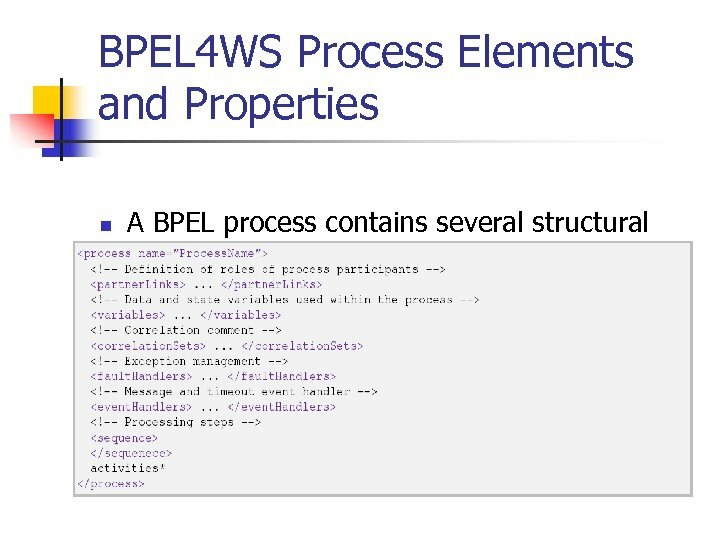 BPEL 4 WS Process Elements and Properties n n Activities elements : Activities are the processing steps, performed in a BPEL body. 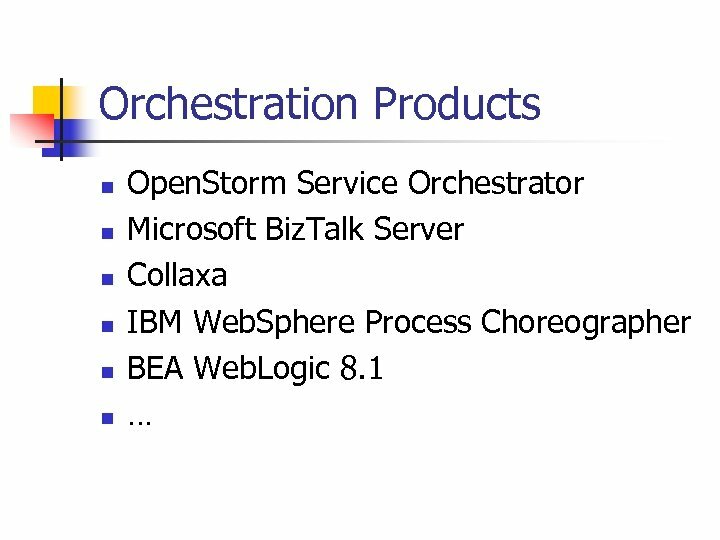 Primitive Activities : invoking other Web services’ operations. : waiting for the client to invoke the business process by sending a message. : generating a response for synchronous operations. : manipulating data variables. : indicating faults and exceptions. : waiting for some time. 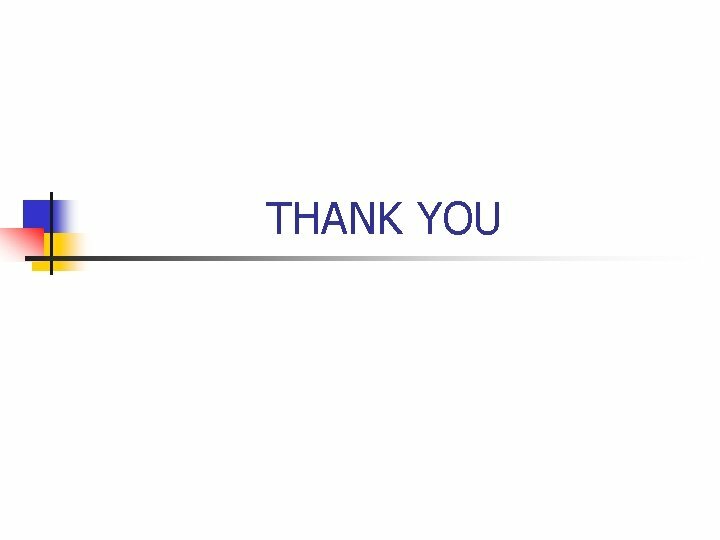 : terminating the entire process. 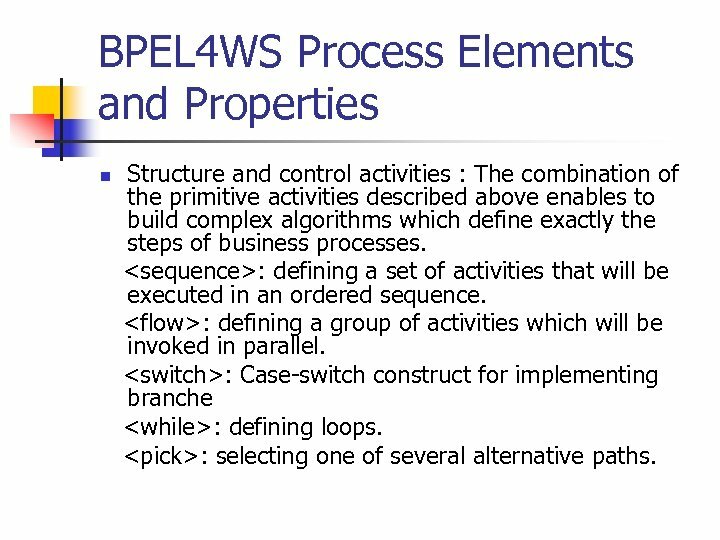 BPEL 4 WS Process Elements and Properties n Structure and control activities : The combination of the primitive activities described above enables to build complex algorithms which define exactly the steps of business processes. : defining a set of activities that will be executed in an ordered sequence. : defining a group of activities which will be invoked in parallel. : Case-switch construct for implementing branche : defining loops. : selecting one of several alternative paths. 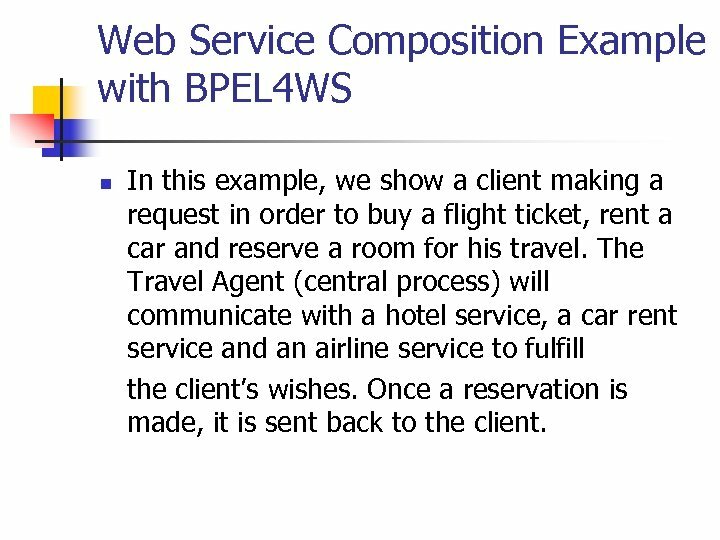 Web Service Composition Example with BPEL 4 WS n In this example, we show a client making a request in order to buy a flight ticket, rent a car and reserve a room for his travel. The Travel Agent (central process) will communicate with a hotel service, a car rent service and an airline service to fulfill the client’s wishes. Once a reservation is made, it is sent back to the client. 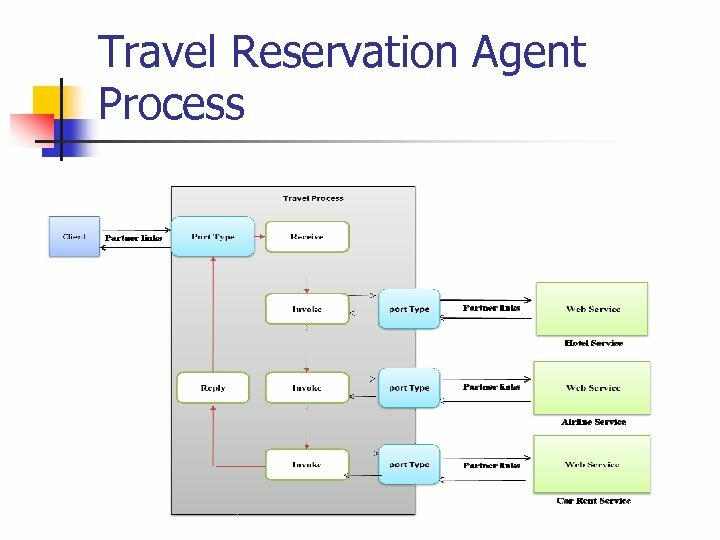 Travel Reservation Agent Process n n A simplified bussiness process for a travel reservation agent is defined: The client invokes the business process, specifying his name, the destination, the departure date and the return date. The BPEL process checks if it is possible to book the flight ticket with Airline A. We assume that Airline Company A provides a Web service through which such bookings can be made. 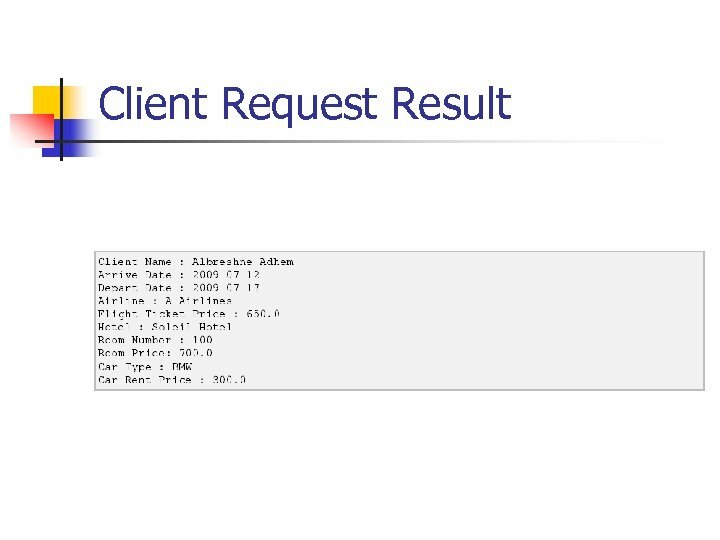 Then the BPEL checks if it is possible to rent a car from Car-Rent Company. We assume as well that the Car-Rent Company provides a web services through which such renting can be made. Finally, the BPEL process reserves a room from a hotel and returns the travel reservation summary to the client. 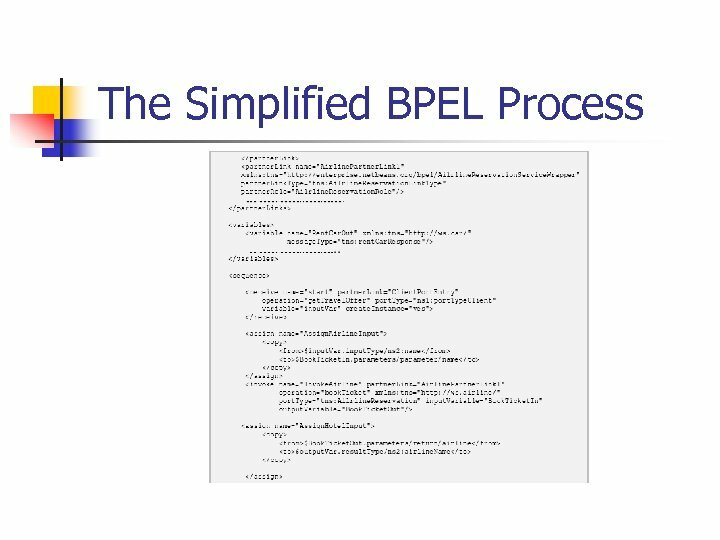 We build a synchronous BPEL process. We assume that the Web services for booking the air plane ticket and the hotel as well as renting the car are synchronous because such data can be obtained immediately and returned to the requestor. 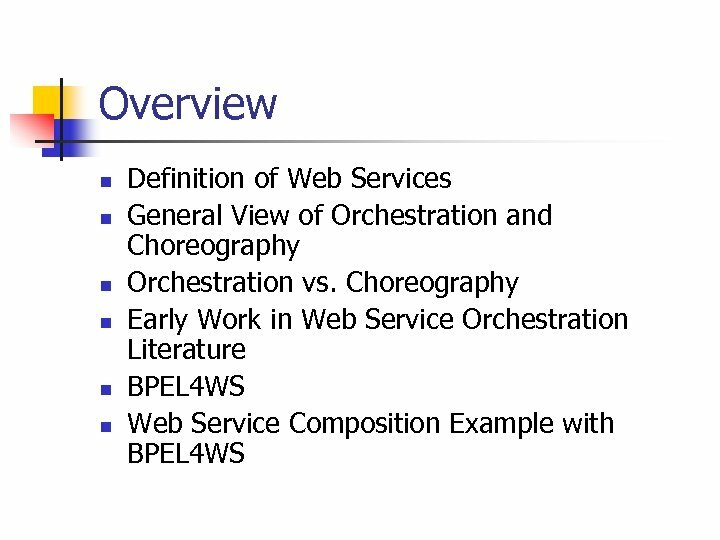 Getting Familiar With the Involved Web Services n Before starting the BPEL process definition, we need to get some information about the Web services involved in the process. These services are called partners. 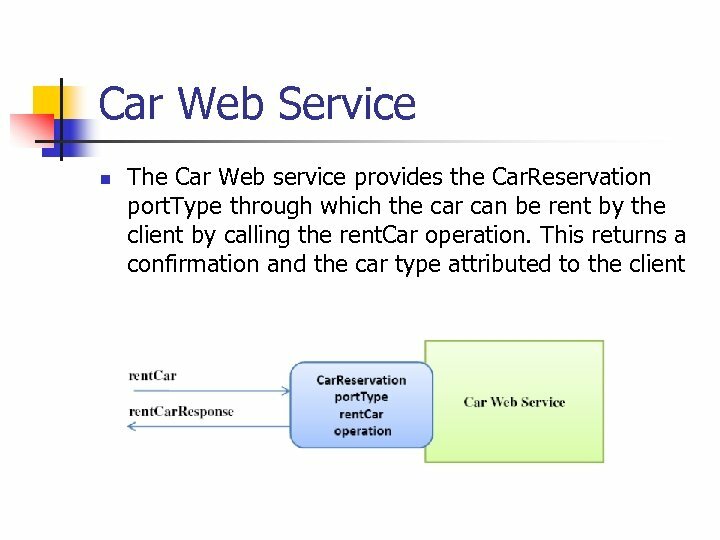 This example involves the Airlines web service, the Hotel web service and the Car rent web service. 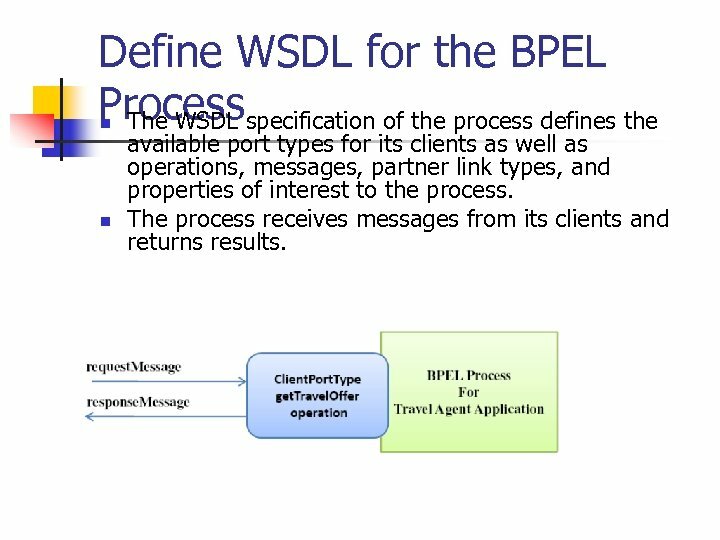 Define WSDL for the BPEL Processspecification of the process defines the The WSDL n n available port types for its clients as well as operations, messages, partner link types, and properties of interest to the process. The process receives messages from its clients and returns results. 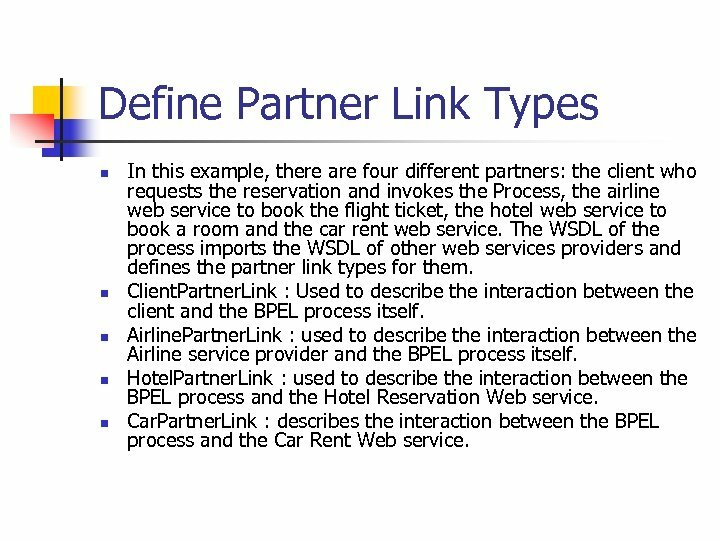 Define Partner Link Types n n n In this example, there are four different partners: the client who requests the reservation and invokes the Process, the airline web service to book the flight ticket, the hotel web service to book a room and the car rent web service. 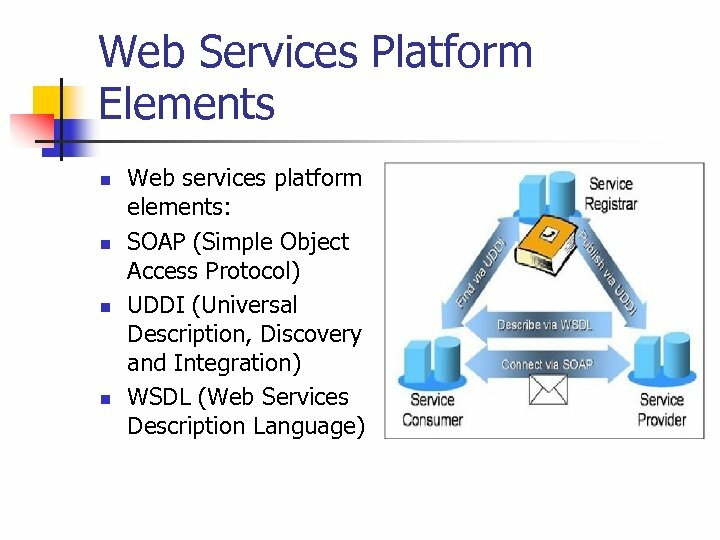 The WSDL of the process imports the WSDL of other web services providers and defines the partner link types for them. Client. Partner. 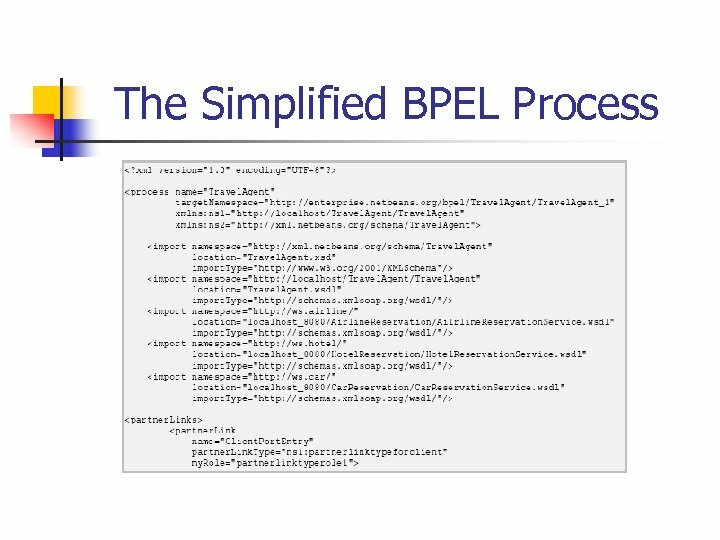 Link : Used to describe the interaction between the client and the BPEL process itself. Airline. Partner. 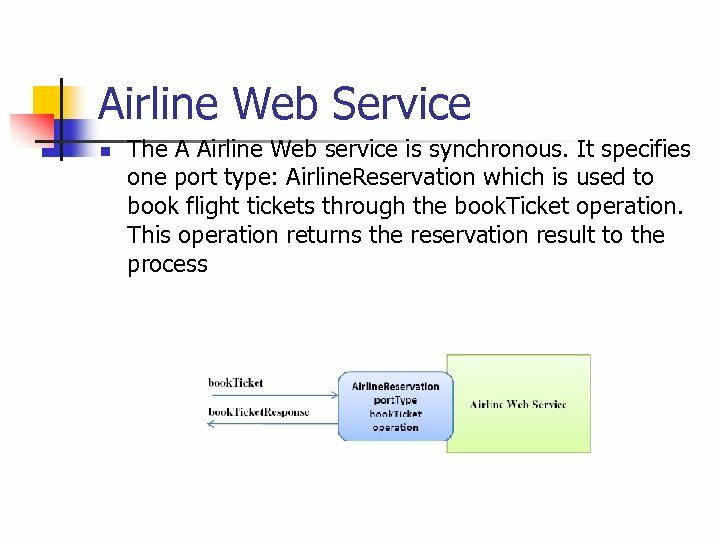 Link : used to describe the interaction between the Airline service provider and the BPEL process itself. Hotel. Partner. 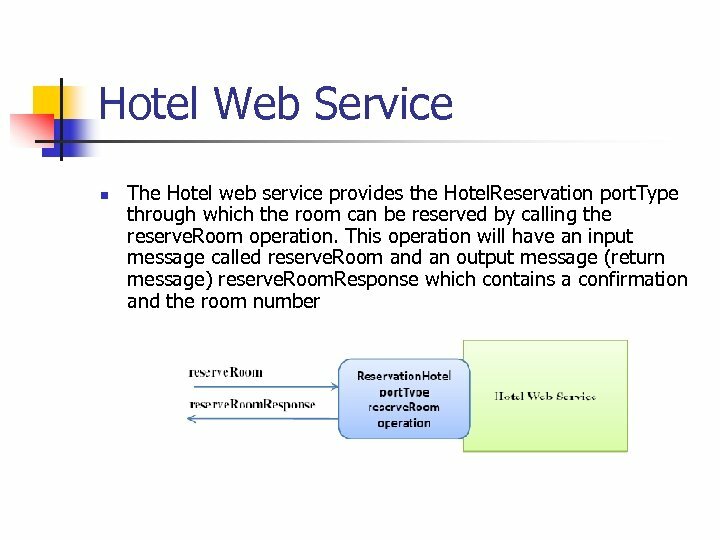 Link : used to describe the interaction between the BPEL process and the Hotel Reservation Web service. Car. Partner. 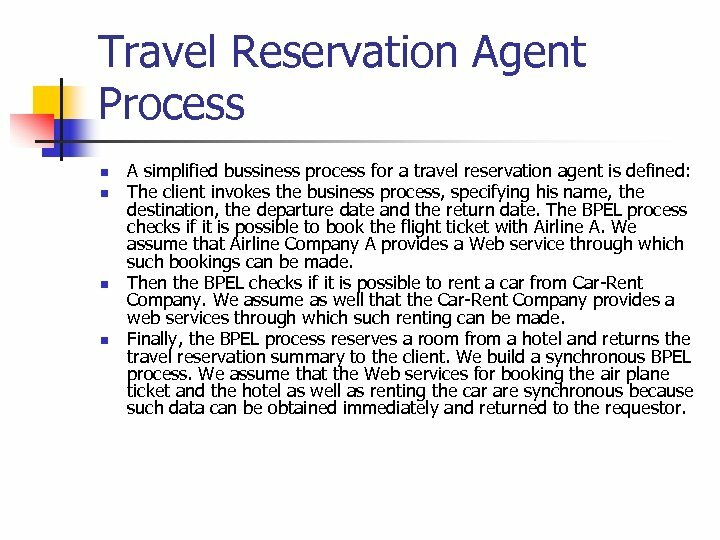 Link : describes the interaction between the BPEL process and the Car Rent Web service. 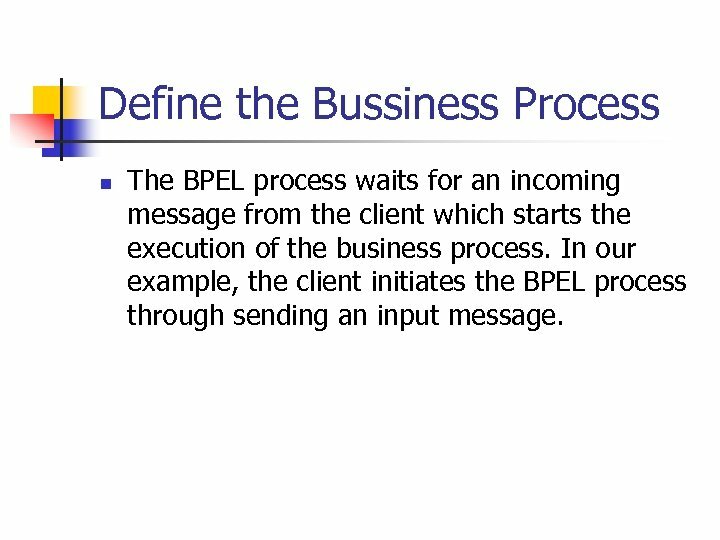 Define the Bussiness Process n The BPEL process waits for an incoming message from the client which starts the execution of the business process. 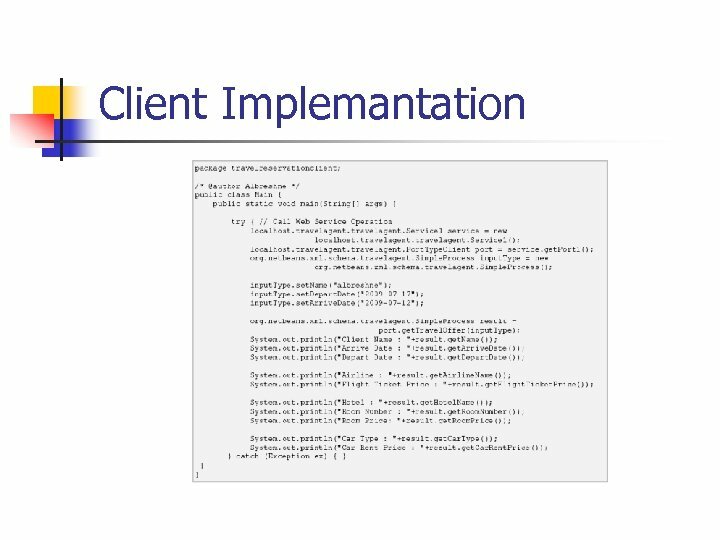 In our example, the client initiates the BPEL process through sending an input message. 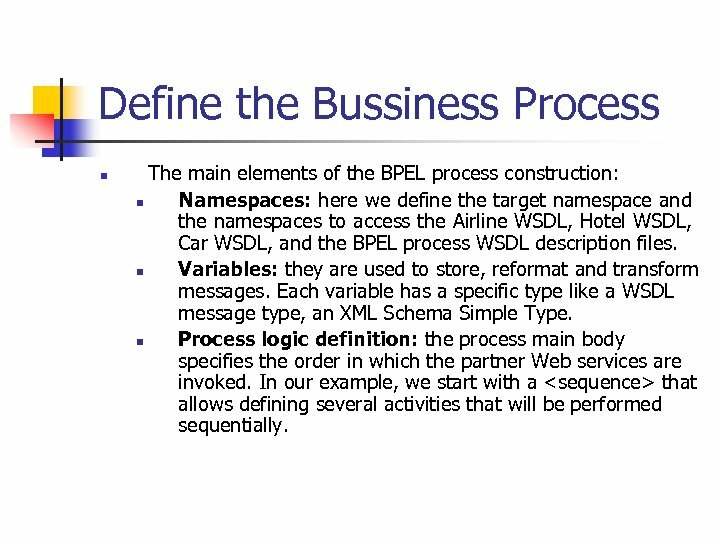 Define the Bussiness Process n The main elements of the BPEL process construction: n Namespaces: here we define the target namespace and the namespaces to access the Airline WSDL, Hotel WSDL, Car WSDL, and the BPEL process WSDL description files. n Variables: they are used to store, reformat and transform messages. 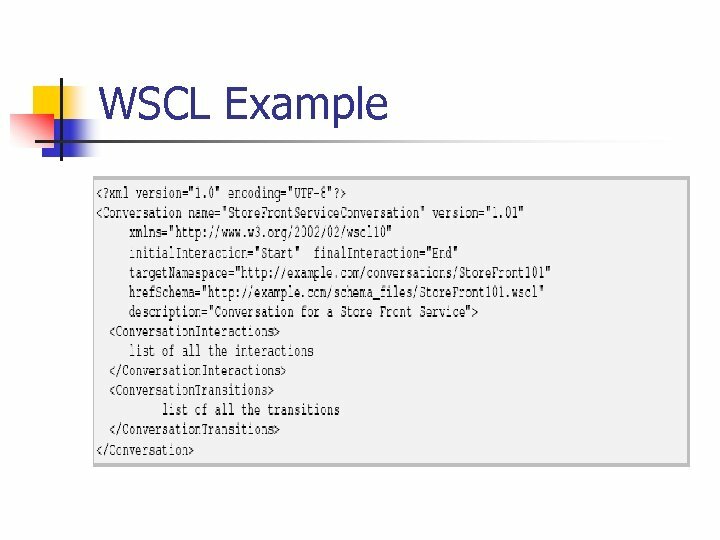 Each variable has a specific type like a WSDL message type, an XML Schema Simple Type. 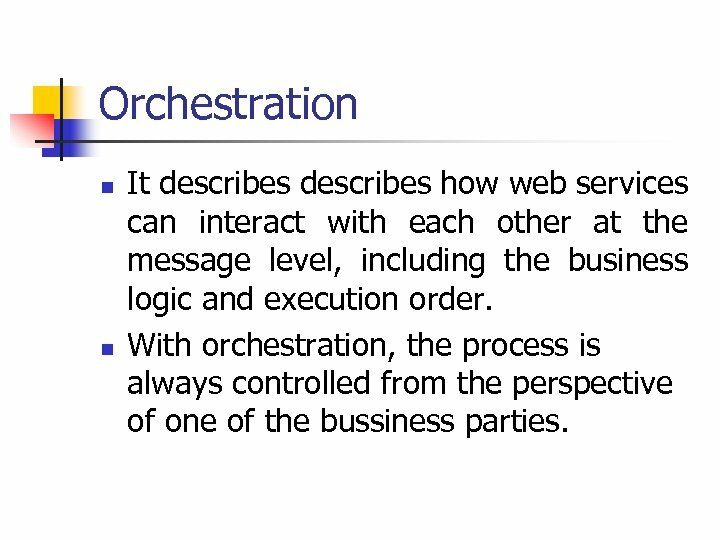 n Process logic definition: the process main body specifies the order in which the partner Web services are invoked. 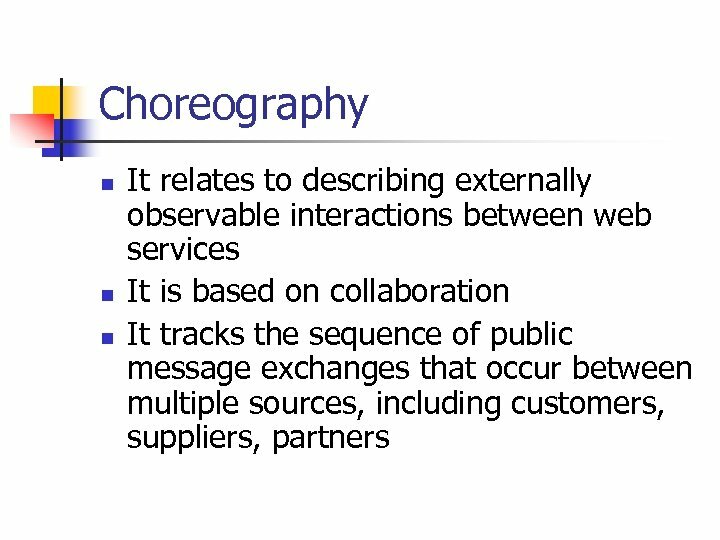 In our example, we start with a that allows defining several activities that will be performed sequentially.